Stars will collide in 2022 and you can watch it with your own eyes! So this headline caught my eye today. " For the first time, astronomers are confidently predicting how to see this type of brilliant blast, which will be visible with the naked eye." Sounds pretty intense. Four years from now, you may be able to witness a new "star" appearing in the night sky, a cosmic gem that should glitter in the northern wing of the constellation Cygnus, the swan, for a good portion of a year. For the first time, astronomers are confidently predicting that a specific stellar system will explode within a defined period of time, becoming more than 10,000 times brighter than it is now. The explosion will be visible from Earth with the naked eye, and it could be about as bright as Polaris, the north star. The eruption will signal the moment two stars locked in a cosmic dance have merged, exploding into a red nova that will briefly give Cygnus an extra stellar spangle. Its debut should happen within a short enough interval that parents teaching their kids about the stellar tapestry overhead can reliably point to the spot where a new pinprick of light will appear. 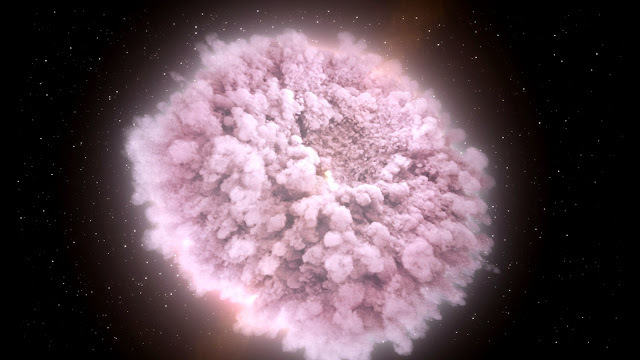 “We get a predicted explosion date of 2022, give or take a year,” says Calvin College astronomer Larry Molnar, who presented the prediction today during a meeting of the American Astronomical Society in Grapevine, Texas.